One of the best things someone can do for me is to give me free lemons…it’s like opening presents on Christmas morning. I jump for joy inside and it never gets old. 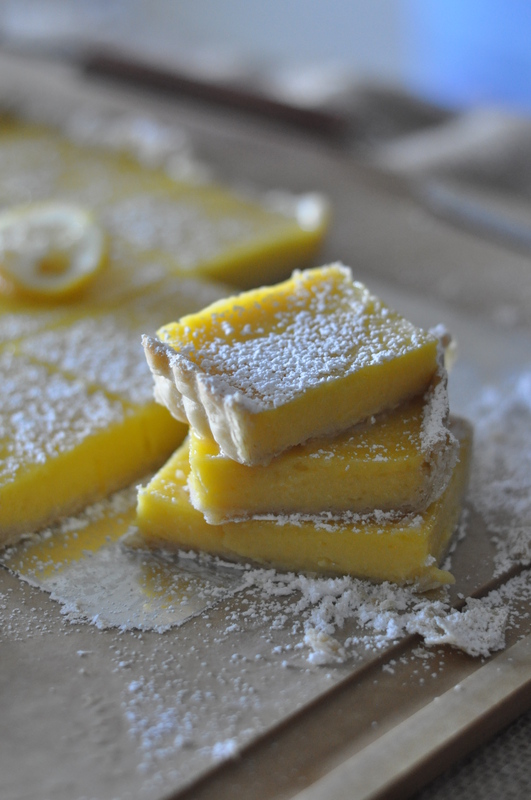 And for whatever reason, lemons always make me think of desserts- the endless possibilities of things I can make with them. Even though tart-like desserts are not my go-to picks (I prefer chocolatey desserts), I still enjoy eating them every once in a while. And I always pair fruity/tart desserts with a good cup of black tea. A gym-mate brought these lemons to our gym from her tree, and I took most of them since no one else wanted to. We don’t have a lemon tree, so any opportunity where there is free lemons, I’m there. The one day when we have a permanent home, that is the one thing I would plant in our backyard. 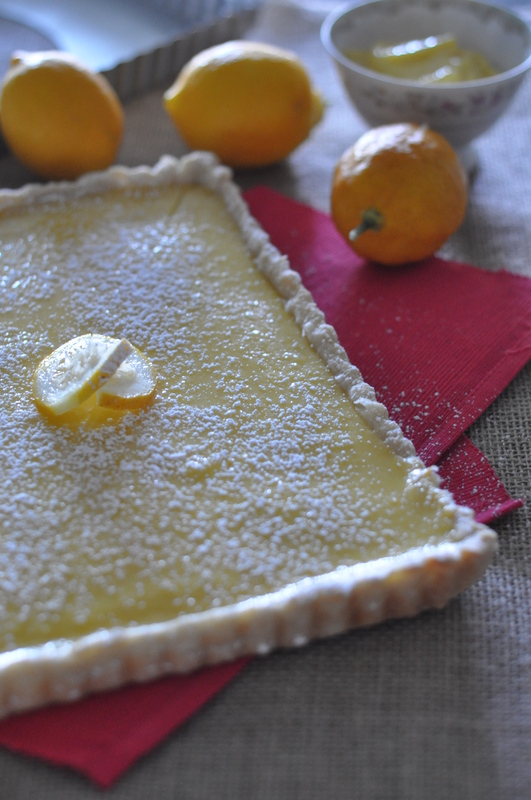 So why a lemon tart? I have this oddly shaped tart pan, measuring about 11in x 8in that I have not really used much. It’s tricky using such pans because you have to estimate and calculate the measurements correctly so that you make enough dough and filling to cover the entire pan. Luckily, I used my usual double batch crust recipe. After rolling out the dough and before blind baking it, I used a fork and thoroughly poked holes throughout. This prevents the dough from puffing up too much. I increased the filling measurements and it was just the right amount, with about ¼ C filling leftover. It does require a lot of egg yolks, which is fine for me because I can use the egg whites to make French Macarons. It is important to allow the tart to completely cool after coming out of the oven before covering and refrigerating. 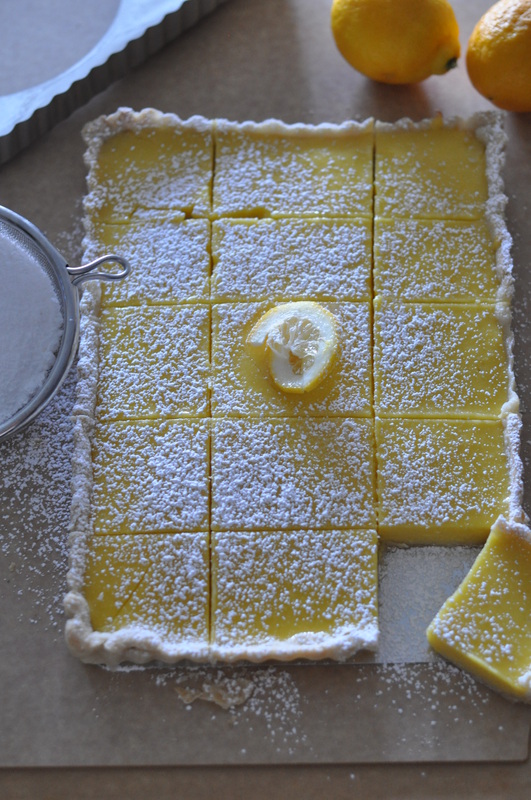 Otherwise, condensation will form on the surface of the tart when it is ready to serve. I prefer to dust a bit of powdered sugar before serving. Another option is to serve it with some meringue. Y= 1-400g dough and 1-257g dough. 1. In a food processor with the dough attachment, combine flour, salt, zest and butter. Pulse until mixture becomes crumbly. 2. Add the water and vinegar in thirds, pulsing in between. 3. Finish mixing the dough by hand on a floured surface. Divide dough in two pieces – one piece at 400g. Wrap, refrigerate and allow dough to rest for at least 30 minutes, or overnight. 4. At this point, you can also freeze the dough. 5. Roll out the 400g dough on a floured surface. Transfer the rolled out dough to the tart pan by carefully rolling it onto your rolling pin. Press the dough into the tart pan. 6. Using a fork, thoroughly poke small holes in the dough. 7. Line a piece of parchment paper on the dough, then fill with pie weights (I use uncooked beans for weights). Blind bake at 400F for 10 minutes, remove pie weights, and bake for another 10 minutes. Y= enough to fill a 11in x 8in tart pan. 1. In a saucepan, combine yolks, eggs, sugar, zest, lemon juice and salt. Whisk to combine. 2. Place saucepan over medium heat. Continue to whisk the mixture to prevent the bottom from burning. You can also trade-off with using a spatula, which allows you to scrape the bottom of the saucepan. 3. Cook until the mixture has thicken, about 6 minutes. 4. Place a strainer over a clean bowl and pour the mixture through. 5. Add cream and stir to combine. 6. 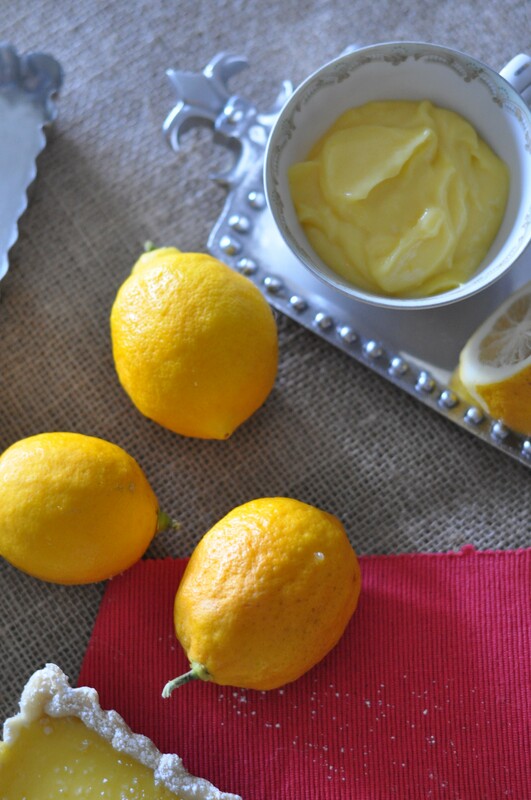 Pour lemon filling into cooled crust. 7. Bake at 375F for 12 minutes. Keep an eye out near the last few minutes as the filling can get brown. Once the filling has set, remove from the oven. Allow to cool completely before covering. Chill in refrigerator until ready to serve. yum! 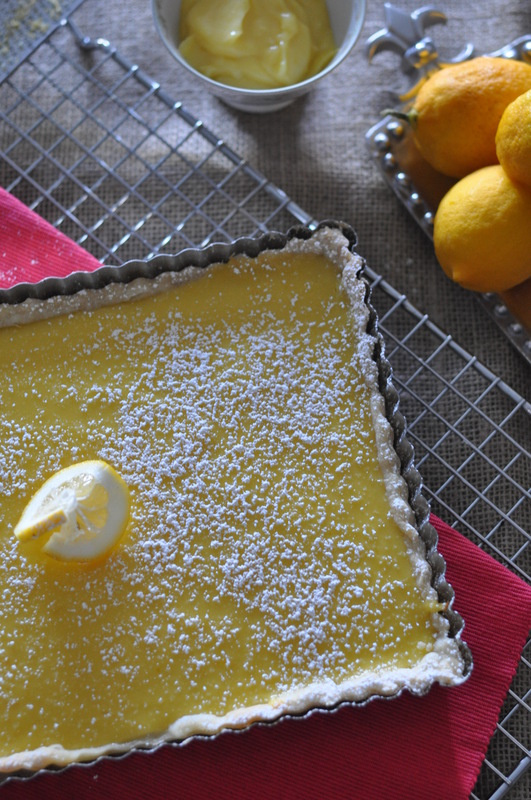 i love lemon tarts! Yao, if we were still working together, I’d totally share these with you!